I love my iPhone. Prior to having my iPhone, I had a Blackberry. I thought it was the best thing in the world until I dropped it in a puddle and killed it. 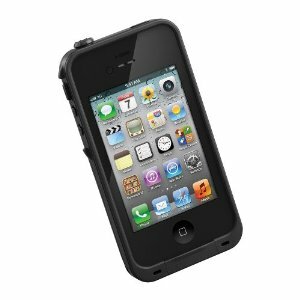 When I got my iPhone, it was given to me in a very popular case: the Otterbox Defender. A lot of people out there thought that the Otterbox Defender was the best iPhone case out there. It’s a fairly sturdy case. I have to say that the Otterbox Defender did its job. It kept my iPhone safe in spite of my toddler’s repeated drops and throws. However, it had a couple of flaws that kept me from being positive that it really was the best iPhone case for me. One is that the Otterbox Defender is not waterproof. (I was so bummed to learn that. It kind of made the name Otterbox a little misleading in my opinion.) The other is that the ports were way too easily accessable to my gooey fingered little toddler. My husband then bought the Griffin Survivor case for his iPod. It’s a sturdier case with better gripping. He was pretty sure that it would be the next case for my iPhone. He liked it enough that he got the Griffin Survivor case for the iPad 2. Then it happened: Norton finally destroyed my Otterbox Defender. He ended up ripping off the flap over the ringer switch. Otterbox does have a great warranty and I could have gotten it replaced. Instead, my husband decided that it was time for something different. Since he’s the tech guy in our family and I’m the one that uses and abuses it, I generally go with whatever he decides I should go with. If he decides that a third option is the best iPhone case out there, then okay. He brought me home the lastest and greatest best iPhone case: the Lifeproof case. And you know what? It’s amazing. This case is actually waterproof. Considering how I killed my Blackberry (dropping it in a puddle) and how a baby Norton killed my iPod touch years ago (getting drool in a port and shorting it out), a waterproof case is crucial. For the Lifeproof case to have its warranty, the owner is required to submerge the case in an hour to make sure that it’s truly leak proof to start. And it is. The only thing that I don’t like about the case is that the screen protector is a little tougher to type on than my old Otterbox Defender case. And the ports, while they are waterproof, are a bit of a pain to open. But considering the abuse my phones go through, it’s a worthwhile investment. In fact, it’s such an awesome case that I bit the bullet and bought the Lifeproof case for my husband’s new iPad as a Christmas gift. What do you think is the best iPhone case ever? Awesome! I’m currently in search of a good case for my droid phone. There are so many good options for iPhones, I should’ve chose an iPhone! I have a droid but thinking about changing to an Iphone on my next upgrade which is in just next month. I will have to remember this info for when I get my case. Thanks! I have an Android, but I have friends with the iPhone so I’ll pass along the Lifeproof case info! They may make them for certain models of android. It’s worth protecting your investment. Looks like a great case. Thank you for sharing. Thanks for sharing! I currently do not have a case on my iphone but I need to invest in one ASAP. No matter how many toys I place or surround my 6 month old with she still reaches for my iphone which goes straight into her mouth! A water proof case would be perfect. There’s nothing as amazing as an iPhone for littles. You may as well just give up and either put a code lock on or start putting kid friendly apps on for her.